Discussion in 'Gadgets and Consumer Electronics' started by vasishta.sushant, Jun 12, 2012. So how are you guys liking the new flagship device from Samsung ? I had a chance to use the S3 at one of the Reliance Digital outlets. Can't really tell how glad I am that I did stick to my note. The phone is small. Too small in comparison. The aspect ratio is making up for all the real estate loss, even after being odd 4.8 incher. But more than the screen size, I was pissed off seeing the build quality of the flagship model from the house of Samsung. I thought that NOTE was shabbily built but this one trounces the NOTE. Having HTX OneX in one hand and the S3 in another, the difference was huge. A big big let down here. Talking about the smoothness, well let me be honest and unbiased here. I didn't find anything out of the world. It isn't, really isn't smoother than the NOTE (but I am on launcher pro and I admit that the stock homescreens lag on the NOTE as well). The HTC oneX was better. The transition between the homescreens are jittery at best. I spent good 20 minutes with the device keeping in perspective the NOTE that I had in my pocket. I honestly didn't feel that the S3 is even a step up (let alone calling a huge step up) from the NOTE. The HTC OneX sure is a step up, at least in the build quality and the overall feel of the device but S3, I'd say its all hype. Not counting the jazzy features like multishot camera clicks, I didn't find any reasonable value addition that Samsung did, that could convince me about the high premium this device is commanding. I so wanted to sell my NOTE and get the S3 (disliked HOX for its shoddy failure rates) and those 20 minutes with the device made everything clear for me. Made for humans. Yeah Sure. But only for humans who have lot of money to spare. I for one am not the one. I've my eyes set on the NOTE-2 release now. Let me know what you guys have to share. Well I liked it .. I haven't used the Note so cant put up a comparison there. Here I go... used it 15 mins at Croma 2 days ago. First impression , very light weight .. surprisingly so. The UI is very very smooth .. (compared to HOX in the high end range) .. keeps up with your finger swipes at all speeds. The back panel has been made flexible (flimsy) for some reason .. maybe to keep the weight down. The white model looks boring :/ the pebble blue should look better. The phone size is balanced nicely with its screen size.probably the longest phone in the market. The camera quick enough .. though can't comment on the pic quality. Felt good to hold .. should have been priced better .. would definetly knock the HOX out of the ring. I haven't personally used any Samsung mobile device for an extended period except for the casual tinkering around at the local mobile store and friend's mobiles, but the S3 and Note have definitely been worked well on the design and quality front. I checked out your phone at the meet and I found the quality to be pleasing, compared to the earlier Galaxy models that pure outrightly felt cheap plastic. PS: I just remembered, I have used a Samsung mobile before, the good old R210! Boy were those phones sturdy, simple and well, good. I used it for some time but then used the HOX, HOX was top of the line for me too !! the S3 on the other hand, well I agree it is very expensive and the dwindling sales are proof of that, it sold well only for the first day !! since then the sales have dropped.. I talked with a top shot of Mobile store and he also echoed the same thing ! the sales are lacking !!! the price is rigged.. coz MS gets it at 34K but can't sell it less than 39K !!! so samsung is fixing the prices.. thats bad, but they will have to reduce the prices very soon !! The note is very good on stock ICS, and with added launchers, it shines.. plus the digitizer input is so useful !! so in today's times, a Note is better to have then S3 ! I would go ahead and say that either have Note or something that is 4-4.2" at max. Note is really good with the digitizer and the business aspect and browsing, which the smaller 4" phone ar more suited to the masses. Everything else in between does not fit. S3 is the best phone out there in terms of sheer power and fluidity and features, all other things are just personal preference. the Galaxy S III didn’t have any problems connecting to game controllers from an Xbox 360, PlayStation 3 and Nintendo Wii. If you are curious what else was tested, check the full video below, which runs from almost half an hour. 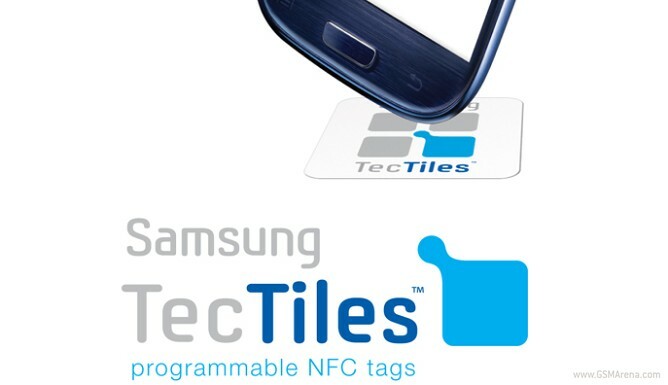 The TecTiles programmable tags however, take the practicality of the aforementioned function to a whole new level.As you have probably guessed by now, the Samsung TecTiles are programmable tags, which set off a predefined function or setting of your Samsung smartphone. Now that is bloody awesome. RajaPraveen and dbg, I have asked my friend again coz he is also of the same view as that of Raja.. that S3 is the best and he has used the competition extensively.. so I will wait for his comments.. I am forced to think that perhaps my using S3 for one hour was too less.. specially coz of raja's view.. I will get it and then test it !! Good is an understatement ..
mystic_dreamer and pELLuRD like this. ManISinJpr and pELLuRD like this.